Stanley Picker Gallery is delighted to welcome back members of The Women’s Institute Worcester Parkers, to develop new art and design works inspired by the gallery’s current exhibition “You say Volvo, I say Potato…” Outcomes will be showcased onsite in the Stanley Picker Gallery Lobby 15-17 November 2018, with a celebration event on Wednesday 14, 4-7pm. The Worcester Parkers is busy and popular group who offer a broad range of leisure, practical, and social activities, including trips locally, nationwide, and overseas! The artists presenting “You say Tote Bag, I say Art…” enlisted in a workshop as members of the Worcester Parker’s Art Club. 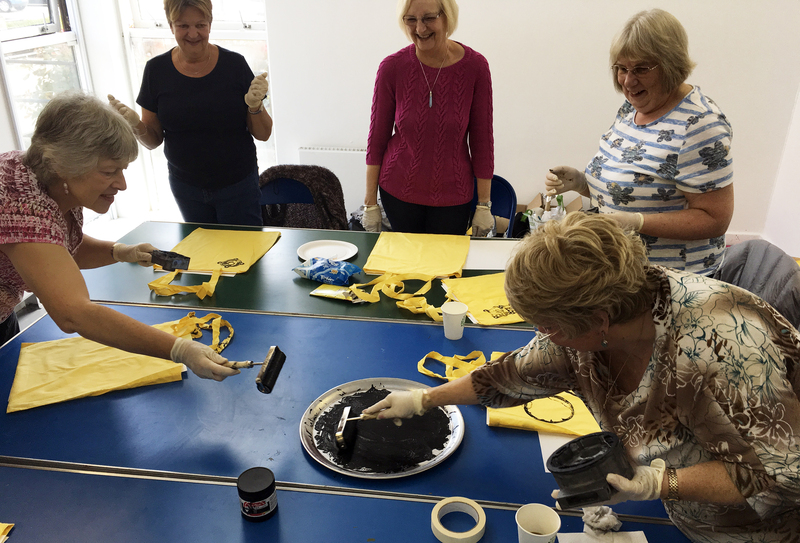 Throughout the day, with activity tailored to meet the interests and requirements of individuals, the Worcester Parkers learnt about Michael Marriott’s practice. They questioned the blurred lines between art and design, discussed themes of use and re-use that permeate the show, and took a trip down memory lane – sharing car stories, and nostalgic associations with the colour yellow. Like the designer, they experimented with different approaches to print, graphic design, and textile design. Outcomes to included plywood coasters, and ‘bespoke designer bags’ to carry them home in. We were joined on the day by Kingston School of Art BA Graphic Design student, Karim Isaac-Shah, who shared some of his top design tips, and favourite art-sites to visit around London. The Gallery team think that their work looks great, and hope that you will enjoy a browse of their collection. Unfortunately the items are not for sale, as their makers plan to use them!